A vicar's daughter chained herself to the railings of a church building close to Westminster Abbey in protest at a church investment group's plans to build a retail park in her home town. 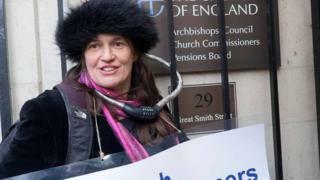 Victoria Harvey placed a bike lock round her neck and railings at Church House, Deans Yard. She was campaigning against plans by the Church Commissioners for an out of town retail park near Leighton Buzzard. The group said it went on to have a "helpful" meeting with Ms Harvey. Ms Harvey is the daughter of Reverend Dr Anthony Harvey, a former subdean of Westminster Abbey. Her father also took part in the protest. Rev Harvey said he felt "bound to protest" at the Church Commissioners abandoning their mission to be a "model of a mutually dependent and caring community". The Church Commissioners scheme for Grovebury Road in Leighton Buzzard, which includes a DIY unit, four other shops and a restaurant, was approved by Central Bedfordshire Council in February 2013. Ms Harvey said: "It is disgraceful the Church Commissioners are breaking their ethical policy for a quick buck at the expense of our local community in Leighton Buzzard." After spending a "very long time" chained up outside the building, Ms Harvey said she chained herself to a chair in the reception of the church. She then met with representatives from the Church Commissioners, whose activities produce money to support the Church of England. John Weir, Church Commissioners' head of strategic land investment, said: "We held a helpful meeting. "Our guiding principle from the outset has been to offer real retail choice in Leighton Buzzard, which complements the town centre offer."